Scotta,* It is interesting to me. * Where did you find this? I like the explaination of the company Logo. Also owning a 1983 32' sedan, I do not see where they could have lost two feet to produce the 30' model? * How could the price point been worth it? Lots of models I did not know about, like to see a 36 and 44 extended bridge someday. So there is an IG 30. There is an IG sedan in our harbor that the owner says is a 32 but every time I look at it I swear its shorter than our 32 Europa. His ID plate on the transom does not have any reference to length, as ours does. Anybody know of a way to ID a 30 vs a 32, short of sneaking over to the other boat with a tape measure? *From a good vantage point, find the distance off with a range finder. * Measure the angle to the highest point of the boat with a transit. * then solve for the right angle leg of the triangle. * Take a picture of the boat from the same angle. * Make a scale measuring from the waterline to the highest point of the boat. * Use that scale to measure the length. * To check it, pull your boat alongside and see if it is longer. * Note: a dark hull on a boat will make it appear much larger. Am not that curious and am a bit mathematically challenged. Come here and charter a boat out of Buck's Harbor and do it for me please. Payment will promptly be made in consumable alcohol of your choice. Just answered my own question, I think. Looked her up by name on a documented vessel list and she has this hull #: BWQ32073C787 (which is not the # on the little plate on the transom). So she appears to indeed be 32' built in 1987, but what yard is BW or BWQ? *I suppose it's possible as Mark Hardy (Beluga) in Hong Kong had his Gourmet Cruiser built as the first 34. *Thanks, planning on doing that. * Just don't know when. * Don't lock the liquor cabinet! The liquor cabinet is never, ever locked (although my wife has been suggesting lately that maybe it should be). * But some things are sacrosanct. The 30 vs the 32? When I add up the lenght of the berths and settees and the space for your knees at the helm--- The only place they could have reduced would have been in the head and on*the aft deck. Still does not seem worth the effort because all systems and cabinetry would be the same and I can't imagine the price could have been much less. Besides the paper work, the only way I know my boat is a 32 are the numbers on the builders plate. IG*** 32-25********** The 32 is circled in white. * The 25 is the 25th hull built. An Island gypsy 30 was about $ 80 000.00 in the eightys about the price of a*modest family home, and a 32 was about $ 100 about 2 family cars above the 30, an IG 44 flush aft deck was about $ 250. Scott,* You may have an answer to a question that has bugged me since I got my IG32. Most boats have a hull number etched in the glass on the upper starboard side of the transom. Often a surveyor will make a tracing and photo copy it and attach it to the survey. My IG has a teak overlay on the transom all the way up to the caprail. * There is no such number on my transom. My boat was probably painted more than once and someone could have covered the numbers. Bottom line is I can not find one and do not know where to look. I have a number in the owners manual and on the documents but can not find one on the boat. Since lots of IGs from the early eightys had teak transoms, is their another place they molded in the hull number? Or did they just cover it with the teak? Hope you know the answer and I can find it or stop looking. Unfortunally I cannot answer your question. I do know that until the early 90s in Australia there was no requirement to show the hull number or (VIN) on the transom of the boat, identification was found on the builders plate, in line with earlier timber boats manufactured in Australia by the Halvorsens. I dont know what the requirements were for earlier US produced craft. Some likely positions could be on the starboard side, within 1 foot of the transom, most likely near the caprail, but anywhere down to the waterline if the transom is covered in teak, or on the engine stringers, most likely near the engine. John P. my 1988 36IG has no number on the transom either. I have a hull number glassed in the starboard side. I love the pictures of the various IG. Love to get hold of some in high resolution for my trawler scrap book. 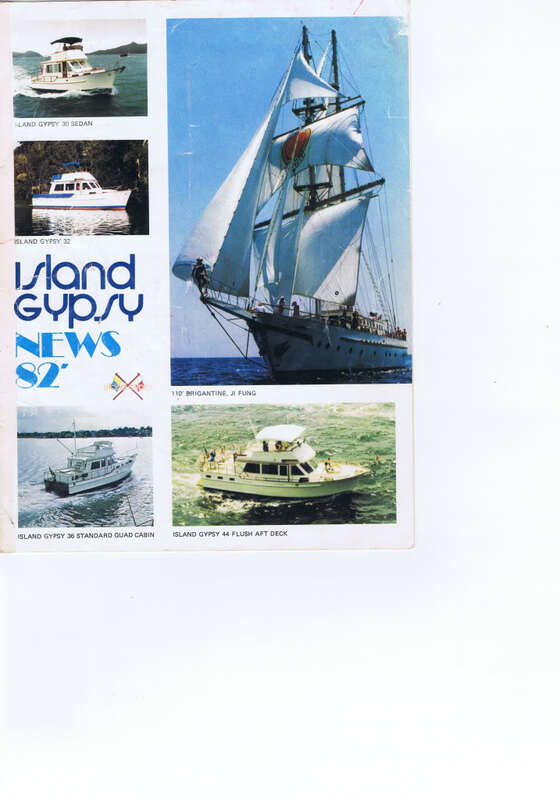 Sorry at the moment I can't post the article, but will do so when I can get hold of a scanner.The article is in volume two of 'Island Gypsy News' the Kong & Halvorsen in house news letter,"for distribution free of charge to owners of Island gypsy boats throughout the world". No date but looks to be circa 1979. The review is by one 'Dex Hart', from Ft Lauderdale, there's a salty name for you.According to Dex, the sedan was all glass, the other two were glass hulls with wooden uppers.The articles notes the IG line is 30',36' & 44' in glass with 50,57,65 & 80' built from wood. There were no 32' IG's mentioned. That would be one interesting article and worth reading. How does one subscribe to the Kong & Halverson newsletter. Does anyone have some copies kicking around. I'd be glad to scan a nd post them. I have only one copy, came with the boat. Will put it up in the next couple of days. I don`t think Kong & Halvorsen Marine Engineering Co Ltd. still exists,if it does I`d be keen to receive their Newsletter too. 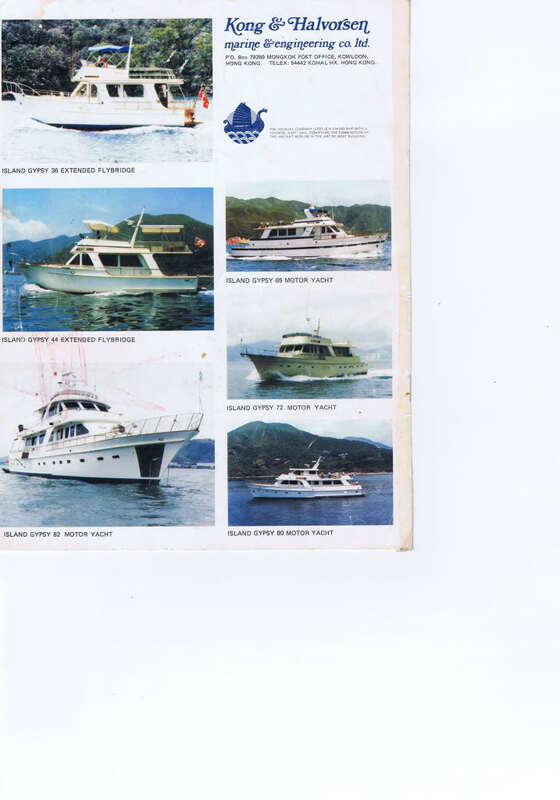 It was a partnership or joint venture between Halvorsen Boats of Australia and Joseph Kong of Hong Kong, to produce the Island Gypsy in various sizes in f/g and in timber. It seems the Halvorsen brand was revived at some point; Island Gypsy as a brand appears to have phased out in the 1990s in Australia. I`m not sure if the 2 brands existed contemporaneously, or if the situation differed between Australia and USA. Halvorsen Boats exists in a more modest way in Australia under a helpful Mark Halvorsen. Marin has followed the brand and may know more, as may others; it would be good to hear from anyone with more information. I`m fortunate to have original K & H books for my IG. They are integrated to cover all models: fibreglass up to 44ft, wooden up to 80ft but lack the detail of "Workshop Manuals".